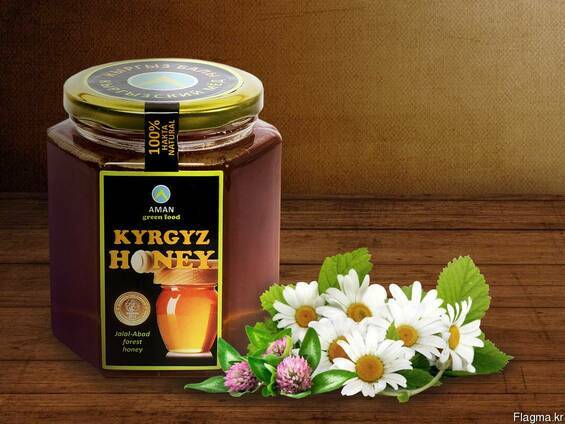 Natural mountain honey is collected in ecologically clean mountainous wooded gorges of the Toktogul district of the Jalal-Abad region of Kyrgyzstan at an altitude of about 2000 meters above sea level, which provides Toktogul honey the high quality of natural product. Bees collect nectar from such rarely flowers as melissa, thyme, rhaponticum carthamoides, marjoram, Phacelia, pink Radiola, echium vulgare, hawthorn and other herbs. It has strong antibacterial properties. It is useful in treatment for atherosclerosis, in liver diseases, and overactive thyroid, and as well as it is used as a sedative to treat diseases of nervous system and insomnia. 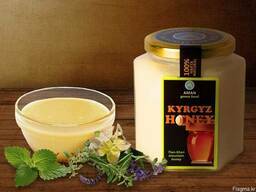 Natural white honey "Kyrgyz Honey"